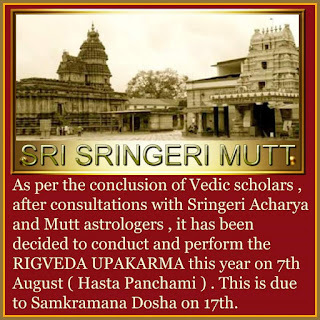 According to majority of the people Rigvedi Upakarma is on 17th August but a minority lead by Sringeri Mutt feel that since there is Sankramana Dosha on 17th August , it should be carried out on 7-8-2016. I'm sharanya from Bangalore. Do you know any place here where they conduct upakarma for rig vediks? Much thanks.